A Florida man has become the first person in the state to have his due process removed and his guns taken before he was determined to be mentally unfit and before he was accused of a crime. UPDATE: Politifact has called this article false, claiming police told them that the man “voluntarily surrendered his weapons.” That information was not available at the time this article was written, nor was it cited in the original piece by the Sun-Sentinel. The Free Thought Project explained the reasoning behind our original article in an interview with Politifact. Hi Allison, thanks for reaching out. In both of the cases mentioned below, neither of the two men were suspected of committing a crime, nor had they committed a crime. Under the fifth and fourteenth amendments, due process clauses are in place to act as a safeguard from arbitrary denial of life, liberty, or property by the government outside the sanction of law. What’s more, neither of the men were granted their sixth amendment rights to be confronted with the witnesses against them. In both cases, simple orders—under new laws—were issued, arguably arbitrarily, which stripped these two men of their property. As I explained in the article. These men had their guns confiscated based on the accusations of others, only. When a person is stripped of their constitutional rights, albeit temporarily, without being given the chance to make their own case based on what can be entirely arbitrary accusations, this is the removal of due process. This is why I gave examples of how these red flag laws can be abused by both law enforcement, spouses, or any group of people who wants to ruin a person’s life by making up threatening stories about others. In Florida, the man could’ve been baker acted, prior to having his guns taken, and then deemed a threat to himself or others by a psychologist. This is not a perfect system, but at least it has a semblance of due process. Regardless of the court issuing an order, no crime had been committed and law enforcement was acting on hearsay only. Hopefully you see the danger in such measures and why we feel it necessary to point them out. No one wants dangerous mentally ill people to have access to weapons, but no one wants gun grabs in the middle of the night from innocent people who have only been accused of acting strangely either. When someone is accused of being a threat, bring that person in, question them, evaluate them, then decide whether or not he needs to have his guns removed. This is what due process looks like, not the other way around. In the original questioning by Politifact, TFTP was asked why we thought the “confiscation” removed a man’s due process. Politifact referred to this as a confiscation which is why we replied with the above information. However, only after this interview did Politifact reveal previously unpublished information about the man “voluntarily” surrendering his arms. At no time did TFTP ever set out to intentionally deceive or mislead people as the case in point is described above. However, given this new information, we have changed the title of this piece and updated it to reflect the new information. Broward, FL — In what’s being called the first gun confiscation of its kind in Florida, police have taken four guns and a couple hundred rounds of ammunition from a 56-year-old Lighthouse Point man. The man was not tried, had not committed a crime, and the guns were solely removed because “experts” deemed him a threat. The guns and ammunition have been temporarily removed from the man under the state’s new “risk protection” law, which is also sometimes called “red flag” legislation, Lighthouse Point City Attorney Michael Cirullo confirmed, according to the Sun-Sentinal. In Florida, prior to passing the new gun control law, people deemed psychologically unfit could be involuntarily hospitalized under what is called the Baker Act. During this involuntary admission to a hospital, the person is evaluated to determine if they are a risk to themselves or others. Only after they had been psychologically evaluated and deemed a threat could the government then move in to temporarily disarm them. Now, however, this tiny bit of due process is no longer necessary and “experts” can simply deem someone a threat and issue an order take their guns. If they do not comply with this order, only then will a warrant be issued. Although the 56-year-old man was subsequently Baker Act-ed, he was told to surrender his guns before this happened. To illustrate the insidious nature of Florida’s new bill and its rights-violating implications, prior to the new legislation, if police would have done what they did to this 56-year-old man—taken his guns with no due process—they would be fired and fined up to $5,000. He also turned off all of his power to the apartment he lived in. By all means, he was acting very strangely. It will now be up to the man to prove that he is healthy enough to ever be able to get his guns back again. This law was a reaction to the shooting in Parkland, however, it is important to point out that there were already laws on the books that should’ve stopped Nikolas Cruz from ever getting a gun. Citing Cruz as the reason for advocating the removal of due process, the anti-gun activists are claiming he should’ve had his guns taken which would have prevented the tragedy. Sadly, however, they are ignoring the fact that he was accused of multiple felonies—and should’ve never been able to purchase a gun in the first place—but law enforcement failed to act on any of it. In Florida, if a person making death threats intends for the victim to fear for her safety, specifically fearful of death or bodily harm, it is considered a credible threat under the law, which changes the crime from stalking, a first-degree misdemeanor, to aggravated stalking, a felony of the third degree. Cruz was reported at least 4 times for this very crime before he bought his AR-15 and police did nothing. While touted as a necessary tool for police, an ERPO and Florida’s new law both remove due process as the person who is accused of being mentally unstable does not have to be present and gets no chance of facing their accuser. To those who may be in favor of such laws, consider the following: There is no way to stop an estranged spouse from call police repeatedly and telling them their ex is threatening to cause harm to others. While the man in Florida had his guns taken for being psychologically unfit, the man in Seattle simply open-carried a pistol and looked out of windows and his guns were taken because his neighbors thought it was strange. Anyone, any time, now has the ability to claim someone else is a threat and have police take their guns. One does not need to delve into the multiple ‘what if’ scenarios to see what sort of ominous implications arise from such a practice. 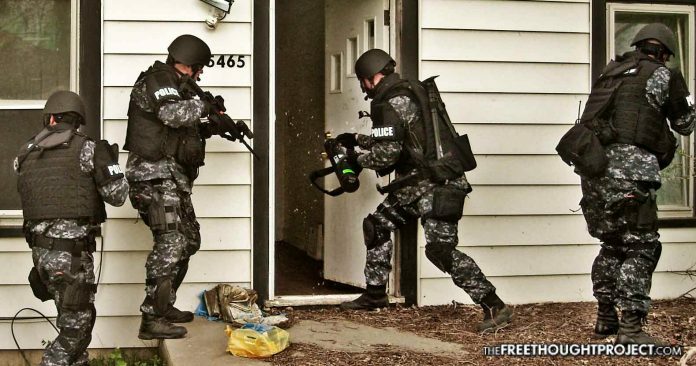 What’s more, police now have the power to deem you a threat at any time and legally disarm you—due process be damned. This is the exact scenario that Donald Trump advocated for in February. Last month, notorious gun-grabber Senator Dianne Feinstein, sat next to Donald Trump and likely salivated over his remarks as he called for the removal of due process and to “take the guns first.” Now, police are doing just that. To those that support these laws under the ostensible notion that it would make you safer, you would do well to remember history before you or someone you know finds yourself subject to these very laws.